Enjoy our list of interesting lead facts. Learn about the uses and properties of lead and how this metal has been used throughout history. Find out how the ancient Romans used lead, what products lead is used to make today, where the chemical element symbol Pb comes from, what countries produce the most lead, and much more with our fun lead facts. Lead is a chemical element with the symbol Pb and atomic number 82. The symbol for lead, Pb, comes from the Latin name for the metal, plumbum. The English words "plumbing" and "plumber" are derived from this Latin name. Lead is a soft, malleable, ductile (drawn out into a thin wire) and heavy metal. It initially has a bluish-white color that tarnishes to a dull gray color when exposed to air. It is corrosion resistant and when melted into a liquid has a shiny chrome-silver look. 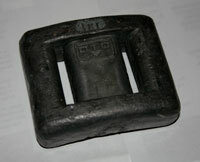 Lead has been used since ancient times due to the fact it is easily extracted from ore and generally easy to work with. The ancient Romans used lead to make plumbing pipes, as joining pins for limestone building blocks and it was popular amongst Roman alchemists. Historically, tin and lead were hard to distinguish between. The Romans called lead 'plumbum nigrum' (black lead) and tin was called 'plumbum candidum' (bright lead). The melting point of lead is 621.4 °F (327.46 °C) and the boiling point is 3,180.2 °F (1,749 °C). In 2008, Australia, China and the United States produced the most lead. Other lead producing countries include Peru, Canada, Mexico, Sweden, Morocco, and South Africa. Metallic lead is rarely found in nature as a free metal. It is usually found in ore with other metals such as copper, zinc and silver. Today, over half of the lead produced is used as electrodes in lead-acid car batteries. Lead is also used in the construction industry for roofing, cladding, gutters and glazing bars for stained glass. Its high density and resistance to corrosion makes it useful as the ballast keel of sailboats and as scuba diving weight belts. Lead is still widely used to make statues and sculptures. It is used to make bullets and shot ammo and is also used in radiation shields around X-ray equipment. Historically, lead has been used as a paint additive, in face whitening make-up, as water pipes, as a preservative for food and drink, as a pesticide, and in paint used on children's toys. However, due to its highly toxic nature, these uses have been stopped in most countries due to the dangers of lead poisoning. If inhaled or swallowed, lead is very poisonous. Lead poisoning can have a major effect on the body's nervous system. It can damage the body's organs and can cause weakness in the body's joints. Wooden pencils have never actually contained lead. The 'lead' of a pencil is in fact a type of graphite that in Roman times was called plumbago meaning 'act for lead', or 'lead mockup'.